As confirmed by multiple sources, beloved actor and Oscar-winning director Richard Attenborough has died. He was 90. Born in Cambridge in 1923, Attenborough was apparently determined to be an actor from a young age. He enrolled in London’s Royal Academy Of Dramatic Arts at 17, where he first appeared in a stage adaptation of Graham Greene’s novel Brighton Rock as the psychopathic teenage mob-boss Pinkie Brown. After that, Attenborough amassed a respectable collection of smaller roles in British films, but in 1947 he reprised the role of Pinkie Brown in director John Boulting’s big-screen version of Brighton Rock. The performance would go on to be Attenborough’s breakout role, leading to parts in dozens of movies over the next 16 years, including I’m All Right Jack, Private’s Progress, and The League Of Gentlemen. In 1963, though, Hollywood took notice of Attenborough and teamed him up with Steve McQueen and James Garner for John Sturges’ The Great Escape. Attenborough played RAF Squadron Leader Roger “Big X” Bartlett, an expert in escaping Nazi prison camps. 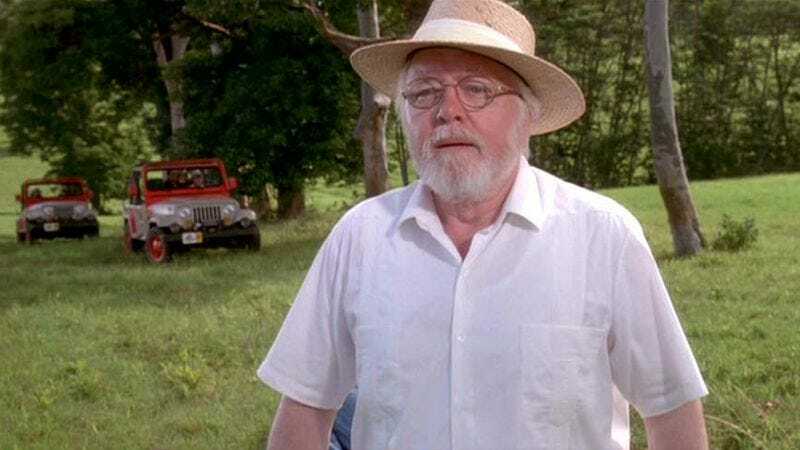 It would’ve been the biggest film in Attenborough’s career—and was at the time—but 30 years later, in 1993, he played the eccentric scientist John Hammond in Jurassic Park. It’s one of the most memorable performances of all time in one of the biggest movies of all time, with Attenborough playing Hammond as a guy who is silly enough to be the occasional comic relief, but also madly driven enough that he’d think a theme park full of actual dinosaurs would be a fun idea. Attenborough had a few more notable acting roles after Jurassic Park, including its first sequel and the remake of Miracle On 34th Street, but he earned some of the biggest accolades of his career as a director. He directed classics like A Bridge Too Far and Magic in the ‘70s, but 1982’s Gandhi might represent his biggest impact on the film world. According to The L.A. Times, the Ben Kingsley-starring biopic was a passion project that Attenborough had been trying to make for 20 years. It was apparently worth it, though, as Gandhi would go on to win eight Academy Awards, including Best Picture, Best Director, and Best Actor.